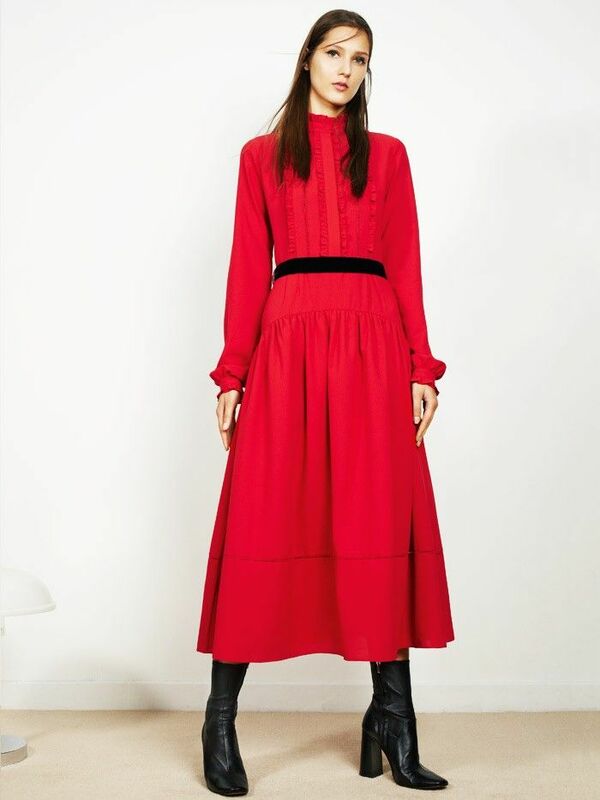 The brand, which is only in its second season, is the brainchild of Catalan designer Eudald Luis. His mission was simple, as he explained to us, "I wanted to create great design pieces with quality fabrication and attention to detail but I wanted the items to be affordable." And Luis has rapidly achieved just that. Offering show-stopping occasionwear, prices start at just below £200 for an intricately detailed blouse. For this season, Luis has served up silhouettes reminiscent of the 1970s with a romantic nod to Victoriana by way of frills and ruffles. Highlights include a richly textured, floor-sweeping gown in gold jacquard that we could imagine on Keira Knightley, and a red ruffled dress with long sleeves that somehow possesses the ability to work for a night out and lunch with the in-laws. Retailers with their fingers hotly on the pulse such as Liberty, Avenue 32 and Flannels have snapped up a substantial selection from the new collection. But who is Luis, and how did he so brilliantly bring to life what we didn’t even realise was missing from our eveningwear collection? If the Perseverance London A/W 16 has intrigued you, keep reading to shop our favourite pieces. This finely cut lace is the stuff of dreams. You won't believe how versatile a red dress can be until you take the plunge. Your very own red carpet moment, right here. This gown taps into the new season's Victoriana trend effortlessly. Add some gothic ruffles to your wardrobe basics. Wear this beautiful skirt on its own or with the coordinating top for a dazzling look. This just confirmed our need for a whimsical lace blouse to take us into autumn. A fresh twist on the LBD. Now here's a showstopper of a dress that does all the hard work for you. We love the sheer, peek-a-boo panels of this chic all-in-one. Want more bragging rights? Discover the 11 new brands all the buyers are going crazy for.